Genesis Sonic 3 & Knuckles (World) "Sonic, 100%" in 55:48.8 by marzojr. In this run of Sonic 3 & Knuckles, Sonic has decided that getting all the emeralds is the only way to go and as such powers his way through the special stages to achieve this (and a perfect ending). This run also avoids using a glitch called horizontal underflow, which is explained in the author's comments. 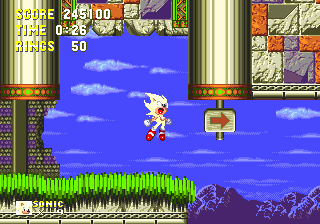 There is a second, smaller encode that omits the emerald collection, loading/end of stage screens and removes the Hyper Sonic flash/music. We also have similar movies with Sonic and Tails, Amy, Knuckles, Tails, Knuckles ring attack, Knuckles 100%, Competition mode and Sonic and Tails on NewGame+.